I learned something important from this recipe: No matter how simple something seems, you can screw it up royally if you’re tired. I’ve not been sleeping well for, well, a year now, so evenings are especially challenging. Typically during the holiday season, I’d be cooking well into the evening, candying and caramelizing and so on. This year it’s all I can do to feed the dog. I will say things improved – rather quickly, you will not be surprised to hear – when I got news that my divorce was finalized. It’s a good thing, too, because it’s quite possible I would have killed someone – or at least their taste buds – the way things were going. I ran across this recipe on the website of a local cooking school, and thought, that sounds easy and as luck would have it, I have all the ingredients on hand. It was 9:30 pm, well past my current bedtime. Here’s a handy tip: When a recipe says add one teaspoon of lemon juice, that is not – and I mean not – the same thing as juice of one lemon. It may look the same to sleep-deprived eyes, but your taste buds will point out your error, post-haste. I suppose this is a mistake that is fixable, if you had enough cream cheese, artichoke hearts, and other seasonings available, and I tried valiantly. I added an extra half package of cream cheese, which cut the lemon somewhat, but not enough to really render the final spread, you know, delicious. It was late and since I was pretty sure any additional efforts would result in additional mistakes, I gave up. I had a potluck brunch the next day and no time to make anything else, and so, yes, I brought it. It will make everyone else feel better about what they brought, I reasoned. One of them, though, made this suggestion: the original recipe called for thyme, but she thought it would be better with some dill. The next time I made it – in the morning, just after my coffee, thankyouverymuch – I swapped out the thyme for some dill, and the end result was perfectly delicious: Light, creamy, and not overpoweringly lemony. The garlic adds a nice – but not overwhelming – bite. It really isn’t a hard recipe, if you’re awake. The original can be found in Carol Dearth’s Cooking Class: A Step by Step Guide to Stress Free Dinner Parties That Are Simply Elegant . Carol Dearth is one of the chefs at the Seattle-area Sizzleworks Cooking School. Drop garlic through feed tube with machine running to mince. Add artichoke hearts; pulse-process to chop. Add lemon zest and juice, thyme and cream cheese. Process to blend. Correct seasonings. Mince garlic. Chop artichoke hearts finely. 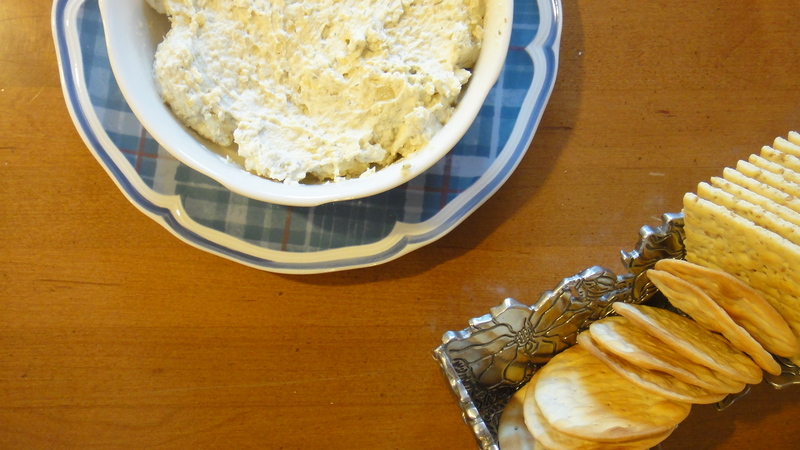 Combine garlic, artichoke hearts, lemon zest and juice, thyme and cream cheese in mixing bowl. Blend well. Correct seasonings. Spoon cheese mixture into two 6-ounce crocks or ramekins, smoothing the tops. Cover tightly and chill. Make ahead and refrigerate up to one week, or freeze for two months. Let stand at room temperature 10 to 15 minutes before serving to soften. Serve on a tray surrounded with crackers or small toasts, or with a pastry bag, pipe rosettes of the cheese spread onto crackers for a more elegant presentation. Sprinkle with freshly chopped chives. Makes two crocks, each serving four.